Happy Thursday to all of you!! I have been sort of down lately...I know bummer right? Well, I know the famous saying, things happen for a reason and I believe it. I do!! Though sometimes it takes that special someone to just, clarify it and put it into a different perceptive for me. So after much chatter and thought, I am doing just fine!! I feel as though I got my Mojo today, because I completed 4 cards!! I can't remember the last time, that has ever happened to me!! So last night, I couldn't sleep, so I printed a few images and just started coloring. I am sharing with you Party Monster, from Pollycraft. He's SUPER cute right. Yes...Pollycraft is BACK!!! Yes, folks, she's back and has the cutest images in store. 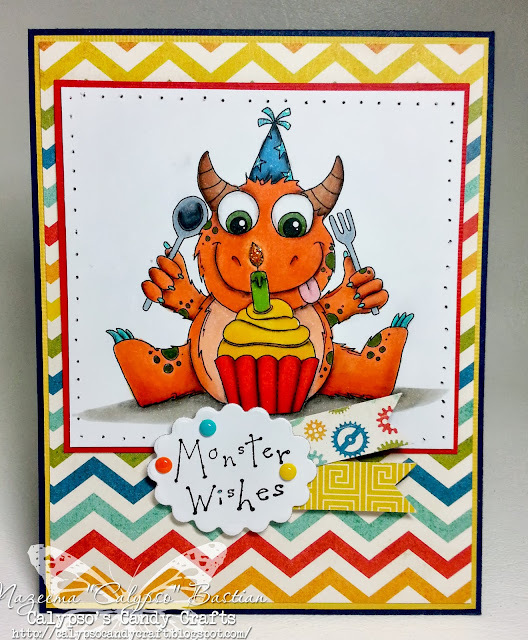 This cute fella was colored with my Copics and the ever so cute sentiment is from Penny Black: Dino Party. I added some glitter glue to the candle flare and the party hat. Well that is all from me today...I will see you back tomorrow for my Stamp and Create w/ Magnolia post.